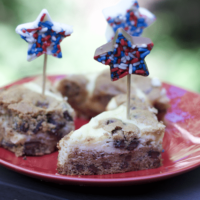 This post Four Ingredient Triple Chocolate Chip Cheesecake Bars is brought to you by Krusteaz as they provided us samples. 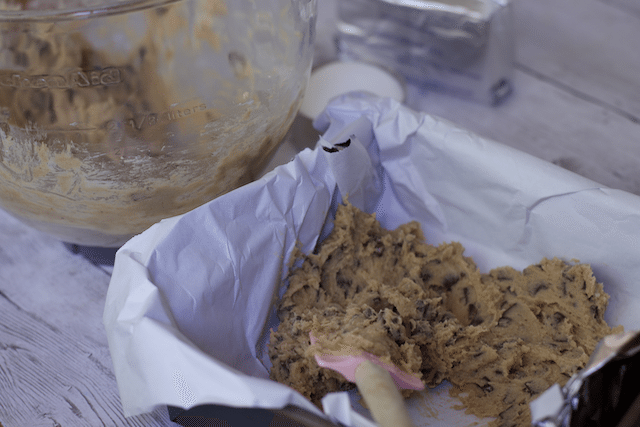 There is no shame in not baking everything from scratch. In fact, I use a lot of brownie mixes in my baking as well as Cake mixes to create some amazing dessert recipes. It takes time and effort out of baking especially if you have several other dishes to focus on. 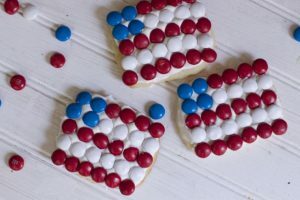 Since Cookie dough is such a popular flavor these days and in the past have combined them with brownie mix to make brookies. 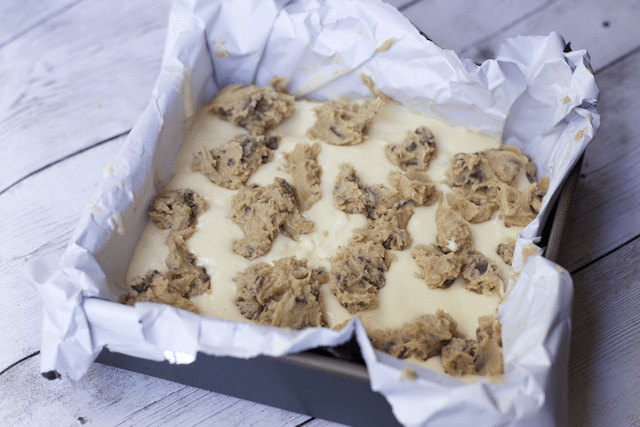 Today we are combining chocolate Chip cookie dough with cream cheese filling for these incredibly decadent but easy dessert recipe. 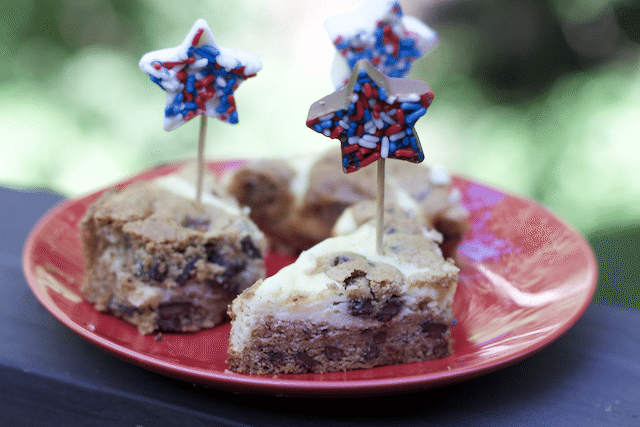 Four Ingredient Triple Chocolate Chip Cheesecake Bars are the perfect recipe to make ahead of time especially for Memorial Day when the day is all about grilling. These beauties will be waiting in the fridge to cut and serve. Using a box mix saves a lot of time from measuring ingredients not to mention realizing you don’t have any brown sugar for a recipe and you are lost. 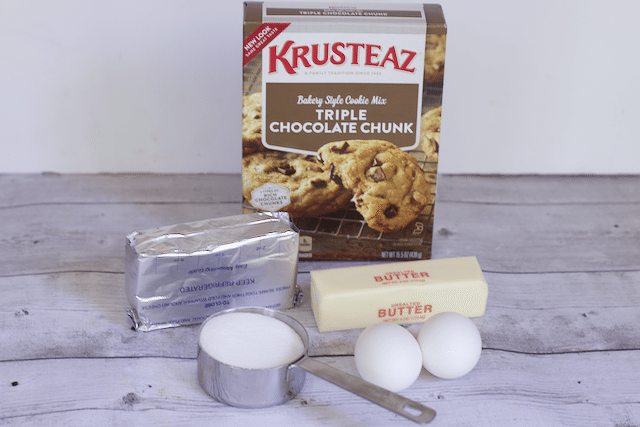 Krusteaz is well known for their baking mixes, from cookies, muffins and pancake mix, the everyday cook gets some help in the kitchen. Box mixes such as Krusteaz are also a great way to get kids in the kitchen. 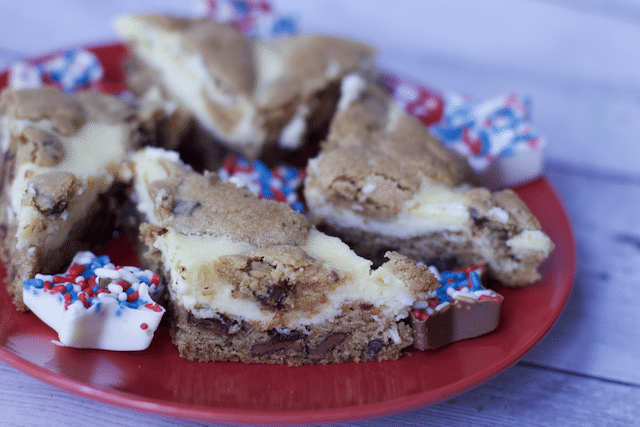 For these Four Ingredient Triple Chocolate Chip Cheesecake Bars all you need is a 15.5 0z package Krusteaz Triple Chocolate Chunk Cookie Mix, butter, cream cheese, eggs and sugar. Make the chocolate chip cookie dough per the instructions on the box. Could not be simpler than that. Just be sure you have both the butter and cream cheese softened. In this heat, that takes no time on the counter. Layer 2/3 of the cookie dough in the bottom of a 8 or 9 inch square pan, I lined mine with pan lining paper for easy removal later. Make the cheesecake filling by mixing the remaining ingredients. Pour the cheesecake batter on top of the cookie crust, then crumble the remainder of the cookie dough on top of the batter. Bake for 25-30 minutes. Allow your bars to cool for about 30 minutes before placing them in the fridge for at least two hours. I find that cheesecake is best the next day when it good and cold. 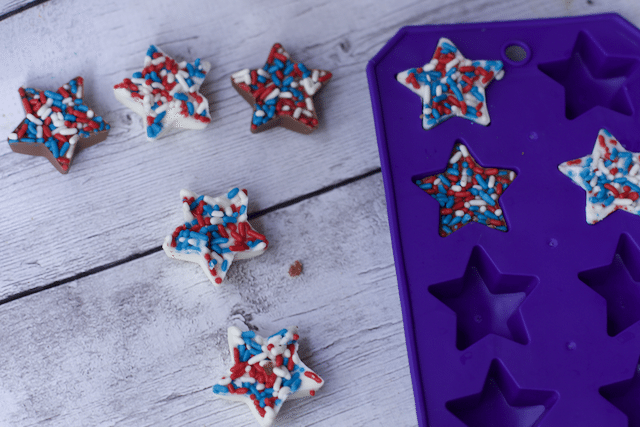 To make this dessert more patriotic for the summer holidays, we made these adorable patriotic chocolate stars out of silicon ice cube trays. When you are ready to use them in these bars or any dessert really, just stick a toothpick inside of them!! I am in love! Or you can just plate them for people to enjoy. 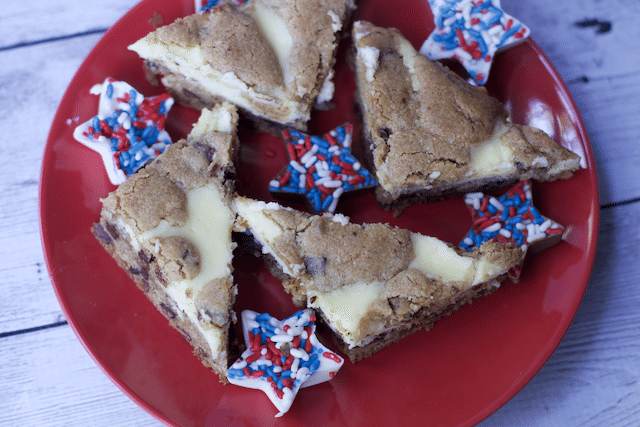 Either way you will love the cheesecake and chocolate chip cookie combination. Why has it taken so long to figure it out.! 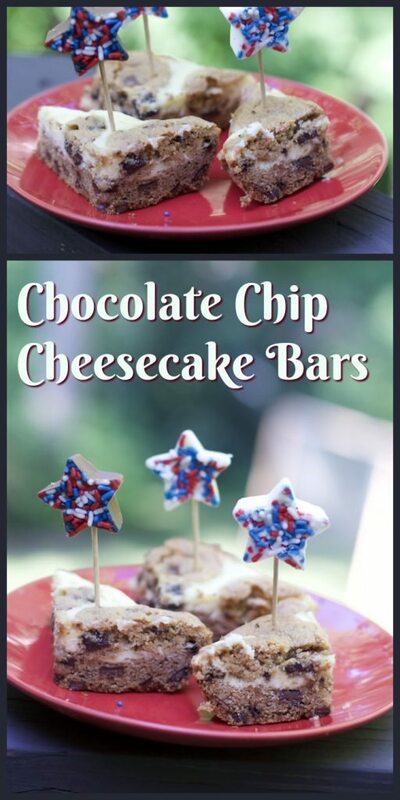 Be sure to pin this for you Memorial Day dessert. A make ahead dessert that your guests will be asking for seconds and maybe even thirds. Prepare the Krusteaz Triple Chocolate Chunk Cookie Mix per the package instructions. 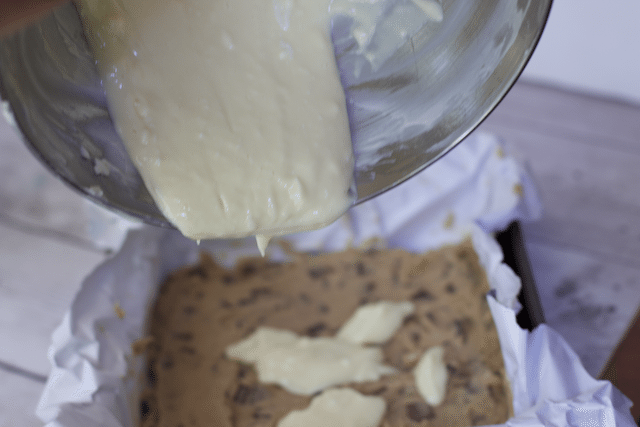 In ungreased, 9- or 8-inch square pan, break up 2/3 of cookie dough. With floured fingers, press dough evenly in bottom of pan to form crust. Spread cream cheese mixture over dough. Crumble and sprinkle remaining third of dough over cream cheese mixture. Bake 35 to 40 minutes or until golden brown and firm to the touch. Cool 30 minutes. Refrigerate at least 2 hours or until chilled. For bars, cut into 4 rows by 4 rows. Store in refrigerator. thank you the best flavor combo I have made in a while. Yum! Two of my favorite desserts combined! I love how easy it is to put together and the added stars. Such a festive touch. These sound so easy and Yummy. 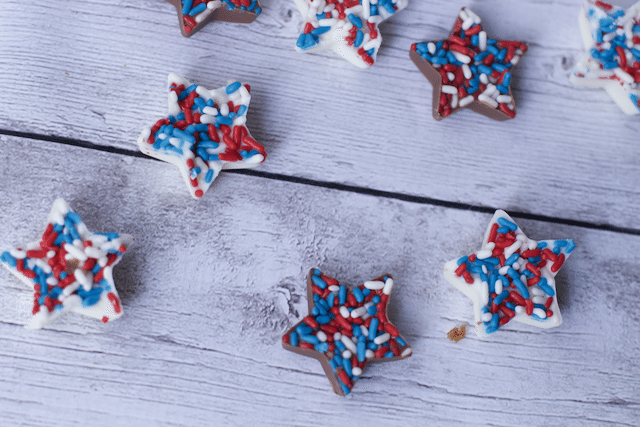 I love the little patriotic stars also. How clever! 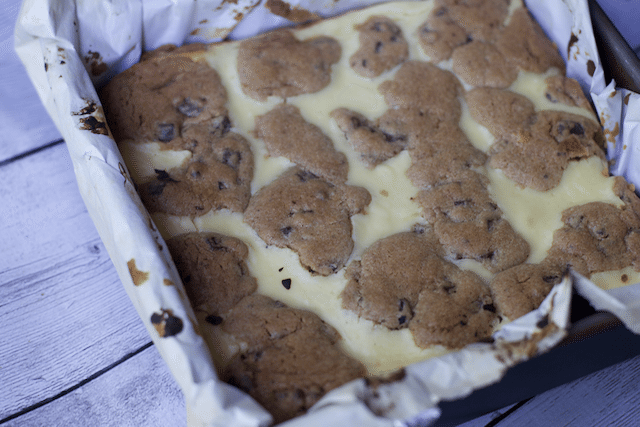 Cookies withing a cheesecake bar! 😀 Those stars look SO cute too! 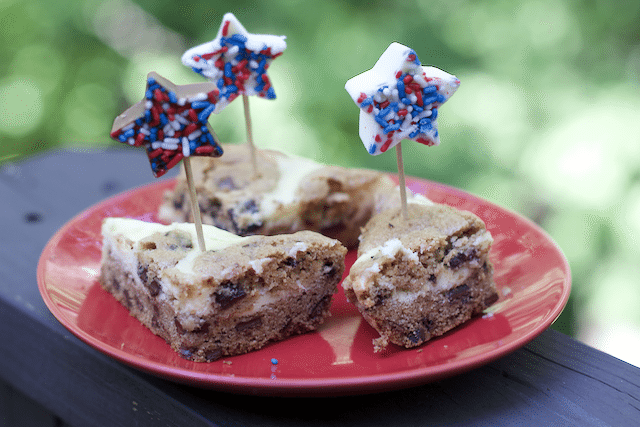 Cookie dough and cheesecake!?! Is this heaven? 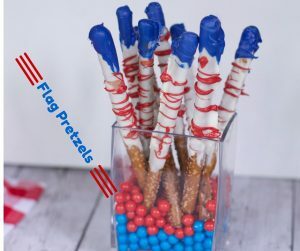 These sound great for a BBQ or picnic! So easy to make and transport.